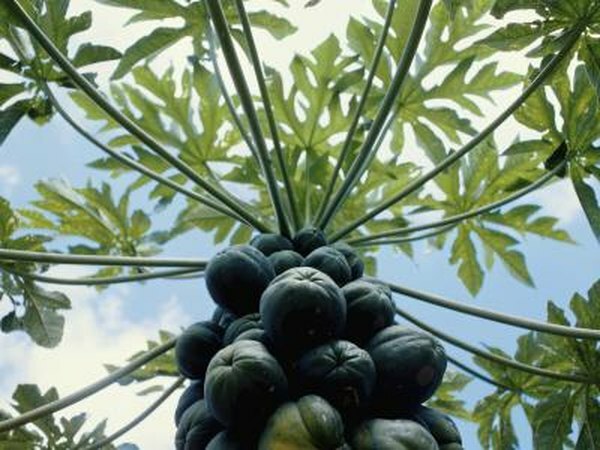 Papaya, or carica papaya, grows leaves in a spiral up its trunk. The leaves live four to six months, according to the California Rare Fruit Growers. The trees grow in tropical and subtropical regions worldwide. Traditional use and preliminary studies suggest papaya may have anti-tumor activity. Papaya and its leaves contain papain, commonly used as a digestive enzyme. Papain also helps treat worms and intestinal parasites, according to the University of Maryland Medical Center. Drying papaya leaves at home gives you a supply of this traditional tea. As with all supplements, consult your doctor before using papaya leaf tea. Harvest or obtain papaya leaves in late spring or early summer for faster drying. Cut the leaves late in the day after the heat has passed, if possible. This is the time of day when plant leaves are most dehydrated. Alternatively, gather fallen leaves. Wash the papaya leaves in running water. Pat them thoroughly dry with towels. Trim the stems 6 to 8 inches long to save room in the drying area, if desired. Make bundles of four to six leaves. Wrap heavy twine around the bundle and tie it, leaving at least 1 foot of twine to hang the leaves for drying. Repeat for each batch of papaya leaves. Hang the bundles of papaya leaves in a dry, dark place. For example, from a hook or nail in a shed or at one end of a clothes rod in a closet. Allow the leaves to dry naturally. The process may take four weeks or longer, depending on temperatures and humidity. Squeeze a leaf to test it -- a fully dried leaf loses its flexibility and cracks rather than bends. Break up the leaves by tearing or cutting them into fragments that will fit into a tea strainer or tea ball. Store the papaya leaf tea in airtight glass jars or crocks. Wear gloves when you cut fresh papaya leaves, which contain latex that can cause skin irritation in some people. Traditional air-drying preserves antioxidants. Exposure to heat and sunlight during the drying process increases oxidation. Plants, including papaya, produce phenols, natural chemicals that protect the plant. In the human body, phenols help neutralize free radicals. Free radicals are molecules that can cause cell damage. Male papaya plants contain higher levels of phenols than female plants, according to the Stuart Exchange database on Philippine medicinal plants. Male papayas are distinguished by flowers that grow in clusters of short-stemmed blossoms, in contrast to the female tree which has sessile flowers attached directly to the stalk without a stem. Pregnant women or women trying to conceive should not consume papaya tea. The latex from papaya could be unsafe during pregnancy.